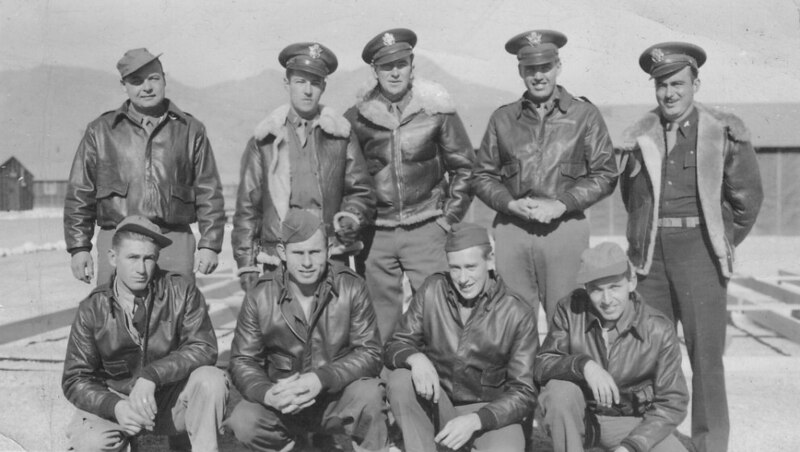 This photo shows the crew of B-24D #41-24143, the "Dippy Dave," as it was comprised at the time of deployment in early 1943. Back Row standing: James E. Johnson - Radio operator; Christopher H. "Kit" Williams - Bombardier (my father); Junior G. "Hank" Hull - Co-Pilot; Russel J. Greene - Navigator; and David L. "Dave" Willis - Pilot. Front Row crouching: Irvin R. "Shorty" Howland - Tail turret gunner (KIA 8/21/43); Arthur B. Franklin - Assistant radio operator; Stanley L. Marshall - Engineer; and Carl C. Burgess - Assistant engineer. Here is another photo of the crew. And here is a picture of the "Dippy Dave" itself.